Most of our trips are opportunistic...this one was the same, with only a couple of weeks planning. It started with checking Ryan Air, and seeing what specials were available from Frankfurt Hahn, about 1.5 hours away. Since Riley loves water, and doesn't remember his time on the Gulf Coast, I really wanted to get him to the beach. So, we selected Pisa as our destination. We wanted something other than the whirlwind tour we had in France, so planned a leisurely trip with nothing other than a visit to the leaning tower planned. It was a great time, and we hope you enjoy our pictures. We stayed at a rather nice two-star hotel centrally located right next to the main Pisa train station. The location was very convenient for access to several restaurants and stores. 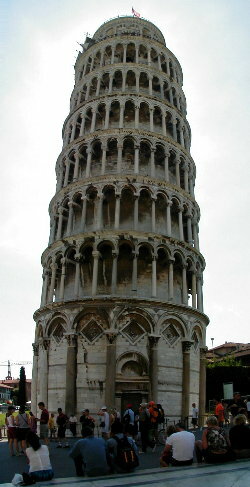 The old town is so small, it was also easy to walk to the main attraction - the leaning tower. 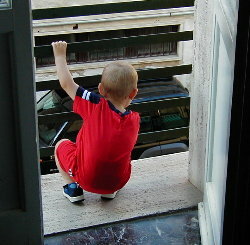 Riley peering at passers-by from our small balcony off our room in Pisa. The cathedral (Duomo) in the Piazza del Duomo. 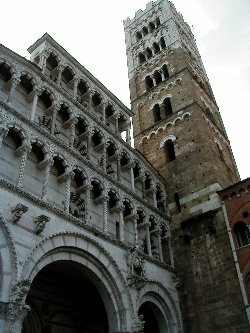 The view of the leaning tower (Torre Pendente) from the front steps of the cathedral. Dale and Riley on the large lawn in the Piazza, with both objects in the background. Riley having fun on the lawn, with no idea how historical this location is! A panorama of the whole complex, with the Baptistry on the far left. After a day in Pisa, we were ready to break away from the typical tourist locations. We were surprised to see some rather large, rugged mountains looming to the north, so we decided to take a trip to get a little closer. 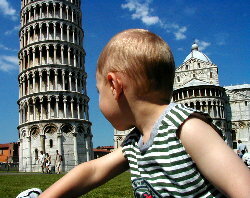 Our first planned stop was the historic town of Lucca, the seat of the Lucca province of Tuscany. The center of the town is encased by a totally intact 12th century wall, and had lovely parks with lots of area for Riley to roam in. 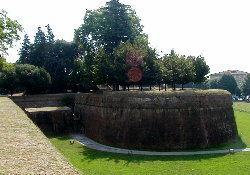 A view of one of the 12 bulwarks from the wall. There was an abundance of parks and green areas on both sides of the wall, including the grove of trees in this picture. 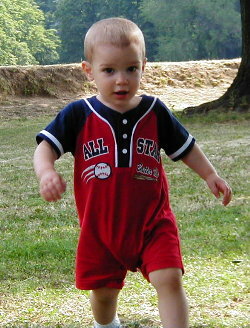 Riley running around in one of the parks. He enjoyed the chance to stretch his legs after spending time in the car seat and stroller. 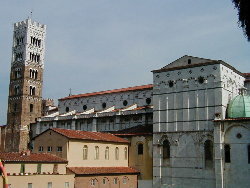 This cathedral is one of the many historical churches in Lucca. The original building was consecrated in 1070, but looks quite a bit different after construction from 12th-15th centuries. A view of the front facade and bell tower. 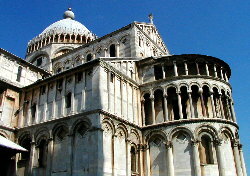 The facade is the most ancient part, and is authentic Romanesque. This picture doesn't do justice to the intricate carvings along the arches. We ate lunch at a cafe with tables set under a magnificent arch. 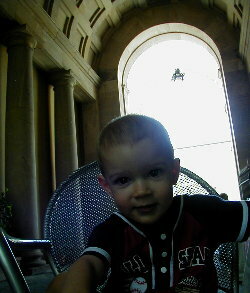 A courtyard surrounded by old buildings was on one side, and a garden with pine trees and fountains was on another. Beautiful architecture was all around, and almost seemed to be taken for granted. From Lucca, we headed northwest to the mountains. We were actually shooting for a nature park on a penninsula near Messa, but decided to stop about halfway between to shorten the trip. The drive between Lucca and Carrara was beautiful, and I wish I had pictures of it. It was rugged terrain like Colorado foothills, and rather dry with scrubby vegetation. The whole region was covered with olive groves, and the houses with terra cotta tiles and beautiful archways dotted the hilltops. I was so glad we got out to the countryside and saw the "true" Italy! 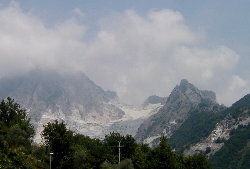 The view of the mountains from Carrara. Think that's glaciers between the peaks? That's actually marble! 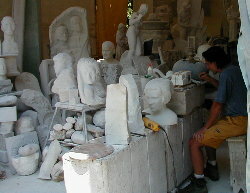 There are numerous quarries in the region, including the one Michelangelo used for his famous sculptures. A craftsman painting a design to be carved into a new piece of marble. There were piles and piles of objects in his studio and for sale next door. They seemed incredibly affordable considering the amount of effort that must go into them. Huge marble slabs (at least 4 x 10 feet) being loaded at the Carrara docks for shipments across the world. There were huge piles grouped by color - from pure white to yellowish to red with white swirls. Monstrous cranes were working busily to load the slabs onto the boats. 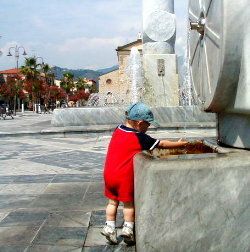 Riley playing in a fountain in the middle of a square where everything is made out of marble. The whole goal of the trip was to get Riley to the coast, so here's some pics from our trips. The beaches are only about 20 minutes from Pisa, so we went twice to the coastline along Tirrenia. Riley scooping sand into a measuring cup the first afternoon of our trip. 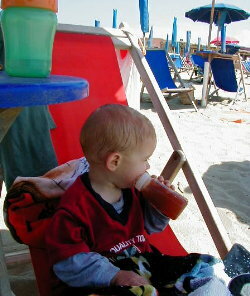 After we saw the tourist locations in Pisa and let Riley rest at the hotel, we had plenty of time to check out the beach. We only stayed an hour or so, but Riley had a great time playing in the waves. Our last day we dedicated to the beach. We finally found the section reserved for the American military, and it was great! We were able to rent an umbrella and two chairs for an unbelievable price, and had a nice relaxing day just chillin'. The water was quite warm (over 80 degrees), but Riley got chilled easily with the healthy breeze of the sea. 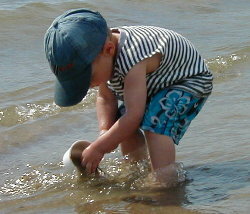 He spent a lot of time playing in the sand, but as soon as he ventured into the waves and got wet, he'd be shivering in less than 15 minutes. We'd trade his tank for a sweatshirt and let him warm up for a while, then start all over again. He loved it! 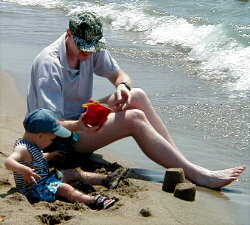 Dale playing in the sand with Riley. Riley was in destructo mode, and would squeal as he destroyed any attempt we made at sand castles. He thought it was great fun! We ran back and forth into the waves and onto the beach again, then stayed in the water and rode the swells that were increasing with the afternoon breeze. 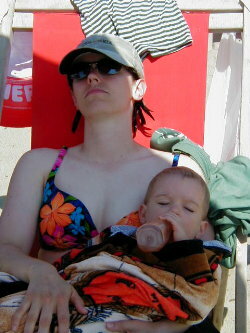 Finally Riley got too cold, and he fell asleep after he was nice and warm in a beach towel. He took over a one hour nap in my arms while I dozed and watched the waves. I can't think of a better finish to our trip!